At M & S Machine, our turning department is comprised of CNC and manual engine lathes capable of turning diameters as small as .25 inches and as large as 38 inches. Over the years, M & S Machine has invested in the latest technology in an effort to improve quality, cost, and delivery. This means higher quality components at a fair and competitive price with improved turnaround times. M & S Machine manufactures rolls and shafts constructed from aluminum, alloy steel or stainless steel, "just to name a few”. 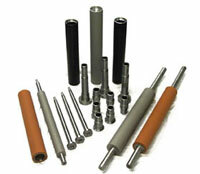 Rolls Types - Nip, press, pull, accumulator, idler, tensioner, dual metal, knife arbors, and grooved, are just a few of the many precision rolls and shafts that are manufactured by M & S Machine's turning dept. Balancing - We dynamically and statically balance our rolls to accommodate the world's fastest processing lines.